If you’re heading to New York Comic Con 2018 next week, be sure to hit up the Fugitive Toys booth, where they will be releasing this convention exclusive Blue Glow Tiny Ghost vinyl figure by Reis O’Brien x Bimtoy x Bottleneck Gallery! 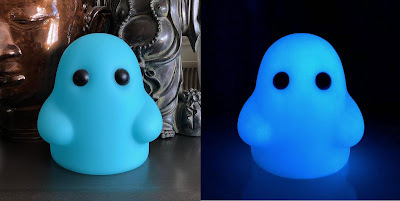 The New York Comic Con 2018 Exclusive Blue Glow Tiny Ghost vinyl figure stands 5” tall and glows in the dark. But there’s a catch, the only way to purchase one is by entering into a daily lottery at the Fugitive Toys Facebook page by October 2nd (a few days BEFORE the convention). The Tiny Ghost Blue Glow Edition vinyl figure is limited to just 200 pieces and can be purchased at the Fugitive Toys NYCC booth for $30.